Master the content from your textbook with this helpful study tool! 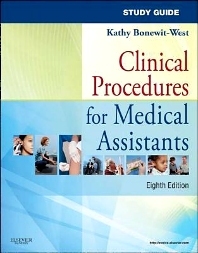 Corresponding to the chapters in Clinical Procedures for Medical Assistants, 8th Edition, by Kathy Bonewit-West, this study guide helps you understand and apply material with exercises, activities, checklists, review questions, and more. Chapter assignment sheets, study guide assignment sheets, and laboratory assignments make it easy to get organized and prepare for what's coming next. Pre-tests and posttests provide a quick assessment of your knowledge. Key term assessments with matching exercises help in mastering new vocabulary. Critical thinking activities utilize realistic situations to help you analyze and apply what you've learned with games, role-playing situations, fun crossword puzzles, and independent study questions. Evaluation of Competency checklists evaluate your performance versus stated objectives and performance standards, updated with the new CAAHEP and ABHES standards.